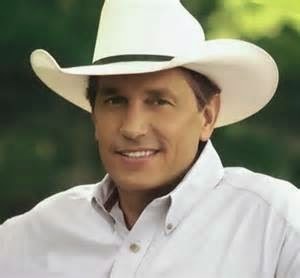 Known as the 'King of Country', George Strait is one of the most influential and popular recording artists of all time. He is known for his neotraditionalist country style, cowboy look, and being one of the first and main country artists to bring country music back to its roots and away from the pop country era in the 1980s. Strait began his musical interest while attending Pearsall High School, where he played in a rock and roll garage band. His musical preference soon turned to country with singers Hank Thompson, Lefty Frizzell, Merle Haggard, George Jones, Bob Wills, Hank Williams, and Frank Sinatra influencing his style. During his college years, he joined the country band Stoney Ridge, answering a flyer the band posted around campus looking for a new vocalist. Strait renamed the group the Ace in the Hole Band and quickly became the lead; they began to perform at different honky tonks and bars around south and central Texas. The Ace in the Hole band remained with Strait, performing as the backup and touring band for the now solo act. Strait has sold more than 100 million records worldwide, making him one of the best-selling artists of all time. His certifications from the RIAA include 13 multi-platinum, 33 platinum, and 38 gold albums. His best-selling album is Pure Country (1992), which sold 6 million (6× platinum). His highest certified album is Strait Out of the Box (1995), which sold 2 million copies (8× Platinum due to being a box set with four CDs). According to the RIAA, Strait is the 12th best-selling album recording artist in the United States overall.